« What is NeuroKinetic Therapy? The following experiment was created by Dr. Keith Williams, professor of biomechanics at UC Davis. It provides the scientific proof for NeuroKinetic Therapy. Simply stated, this experiment shows how the motor control center unconsciously selects certain muscles to perform the actions of others, when those muscles are inhibited. It is my contention that the motor control center selects certain muscles based on the individual’s history and preferences. The job therefore of the NeuroKinetic therapist is to uncover these dysfunctional movement patterns and correct them. EMG measures can provide insight into how the motor control functions. This section will illustrate how quantified EMG signals can provide some insight into how we activate different muscles depending on the exact conditions a movement or force application is done. 1) Pronation/Supination Torques & EMG Record 2 seconds of activity at 500Hz from the biceps and the brachioradialis using the Data.Collect program. Set the Data.Collect program up to calculate average EMG. 2) Subject should stand with the upper arm at the side, the elbow flexed to 90°, the forearm at a mid-position with the hand holding the ring upon which weights are attached. 3) Attach weights to the ring in one of three positions for each trial, as shown on diagram on the accompanying chart. 4) Three different weights (5, 10, and 15 lbs. ), plus a reference condition of no weight will be used in each position. If 15 lbs. is too much weight to be held, smaller increments can be used. The elbow should remain flexed isometrically in each condition at 90°. No forearm rotation should be permitted with the forearm maintained in the mid-position. 5) Record the magnitude of the averaged EMGs for each load in Table 1 by analyzing the data as described above. 1. What effect did the positions of the weights in part 3 have on the EMG results for the biceps? 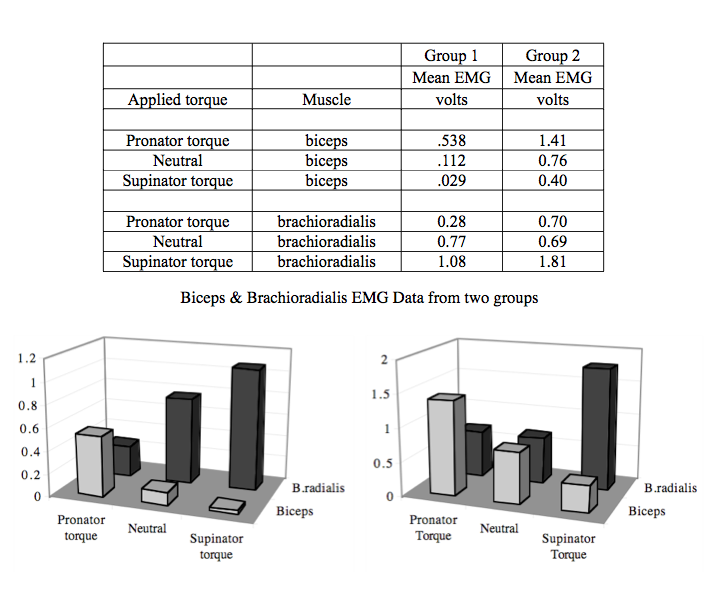 Plot Weight vs. EMG for each of the three torque positions and examine how biceps and brachioradialis EMG’s vary depending on the type of forearm torque applied. Knowing that the biceps muscle assists in supination, explain the results. This experiment provides data that illustrates how EMG can provides insight into how muscle recruitment is affected by the local loading conditions experienced by the body. Should tests involving EMG of elbow flexion be done in a pronated, mid, or supinated position? • Each of the three conditions involve no difference in the task of elbow flexion – the same weight is lifted and the joint position is the same – all that differs is the torque about the r-a joint. • Example data for two groups and a plot of EMG vs. weight is shown above. The results are what is usually found. • Where there is a pronatory torque applied, there is much greater activity in the biceps than with either the neutral or supinatory torque. This is an adaptation to the side action of the biceps involving supination. During elbow flexion, if the biceps is active it will also cause supination torques. With a pronatory torque it is useful to have the biceps active because the supination side action will counter the applied torque. • For the supinatory torque, if the biceps is active some other pronatory muscle (pronator teres, quadratus, brachioradialis) will have to be active both to counter the applied supinatory torque and the side action of the biceps. Based on this EMG result, it is more efficient to shut down the biceps and let one of the other muscles do the work. • A major point here is that there is a sub-conscious altering of neural activation in response to the external forces applied to the joints. We don’t make a conscious decision to change how muscles are used, it just happens. Evidently there is some optimization ability within the CNS that determines the most effective pattern of muscle activation for a given situation, and we have learned this intuitively over years of developing motor skills and motor control. This can probably be generalized to any variety of movements that we might make.